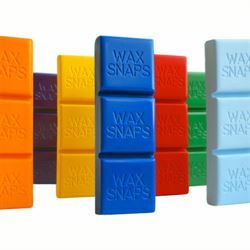 Wax Snaps® offer professional encaustic wax paint in a 40 ml bar: a very versatile and unique shape. Each Wax Snap® measures approximately 1-1/4” long x 4” wide and 1/2” thick. This unique shape allows you to use the whole bar or break off a section with a simple snap. Wax Snaps® are great for printmaking techniques, direct melting on a hot palette or snapping off a section to refill a Hot Cakes® tin. They are also ideal for the workshop and classroom setting, where you can easily snap, dispense and share. Wax Snaps® are the same professional formulation used in our Hot Cakes® and Hot Sticks®. We use US Pharmaceutical Grade Beeswax, Damar Resin, and the finest pigments available, milled to perfection. Highly pigmented, our paints can be used full strength or diluted with wax medium to create glazes or to extend your paints.